How many mph is a knot and how fast is it? What is a nautical mile? If you're wondering how much is a knot, you're in the right place - this knots to mph converter can help you in clearing up your doubts. Type the value into the calculator, and in the blink of an eye, you'll get the answer - equivalent in mph, ft/s, m/s, and km/h. 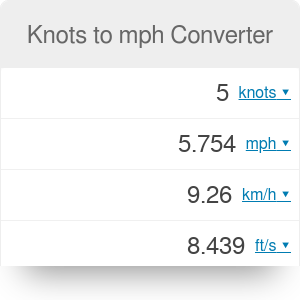 As our calculators are flexible tools, you can also convert mph to knot or any other wind speed unit. Keep reading if you want to know how many mph is a knot or how fast it is. Also, you'll find an informative wind speed chart and all the formulas behind the wind speed units conversions. Nautical miles and knots are the units used in meteorology, aviation, and nautical navigation. What's the difference between them? A nautical mile measures the distance and a knot measures the speed. One nautical mile historically was defined as one minute of latitude (1/60 of a degree of latitude), which is 1.852 kilometers. That's the average value, as the Earth is not a perfect sphere but a geoid. Finding the optimal conditions for a windsurfing or kiteboarding (6-30 knots is a range usually used, depending on the body weight, kite size, and how skilled you are). Think about the unit you want to convert. Let's assume we want to change 40 knots into miles per hour. Type the value into proper box. In our case, we need to enter 40 into the first part of the tool. That's it! Our knots to mph converter did the job! Now we know that 40 knots are equal to 46.03 mph. That's quite a lot! Knots to mph Converter can be embedded on your website to enrich the content you wrote and make it easier for your visitors to understand your message.